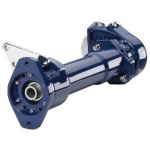 The PTO Shaft Extension is an exclusive, patented Muncie product that allows for direct coupling large displacement pumps on Allison "World" automatic transmissions. Where envelope space around the PTO aperture is limited, the PTO Shaft Extension moves the pump-mounting flange to the back of the transmission for easy installation. 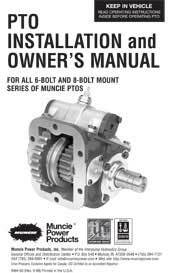 Models are available for both Clutch Shift and Constant Drive Muncie PTOs. Recent improvements to the design facilitate production processes allowing for better delivery times. 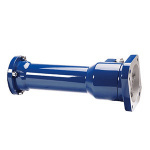 Additionally, all shaft extensions are now offered as wet-spline versions to mitigate rapid wear encountered with continuously powered applications. * Due to the added weight at the back of the transmission it is required that the transmission be equipped with a rear support as provided by the vehicle manufacturer. 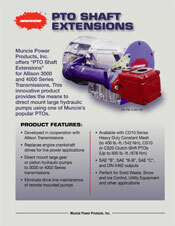 PTO Shaft Extension assemblies cannot be used on transmissions with retarders or rear mounted oil coolers. Maximum Pump Weight: * 111 lbs. Maximum Torque (intermittent): 500 lb. ft.